Dean: Hello! Thanks for having me here! I’m super excited to try what you’ve made for me. Chef Laith: Hey, welcome! I’m excited for you to taste everything! Dean: Before we dive into the food, I want to know, how long have you been a chef? Chef Laith: 15 years! I lived in New York for my first 10 years, and in the Bay Area I opened my first restaurant. I also joined the service here in Southern California, so I’ve also lived in North Carolina, South Carolina, and Tennessee. Dean: Wow, that’s a lot of places! So does living in these different places help when cooking? Chef Laith: Yeah, it does actually! I have a Middle Eastern background so that helps make dishes interesting as well. Every place you have something you learn from; elevate and move on. Dean: That’s awesome. What would you consider this menu? Is it more French, more American? Chef Laith: I would say this menu is a mixture of food. It’s a fusion of different styles, not just classic. I would say American food would be the best title, because American food we create it and we make it our own. I like to call it “bold rustic”; we changed the menu to be more fun and lively rather than classic. It’s an everyday menu, very casual. Dean: Yes, love it! So, what have you made for me today? 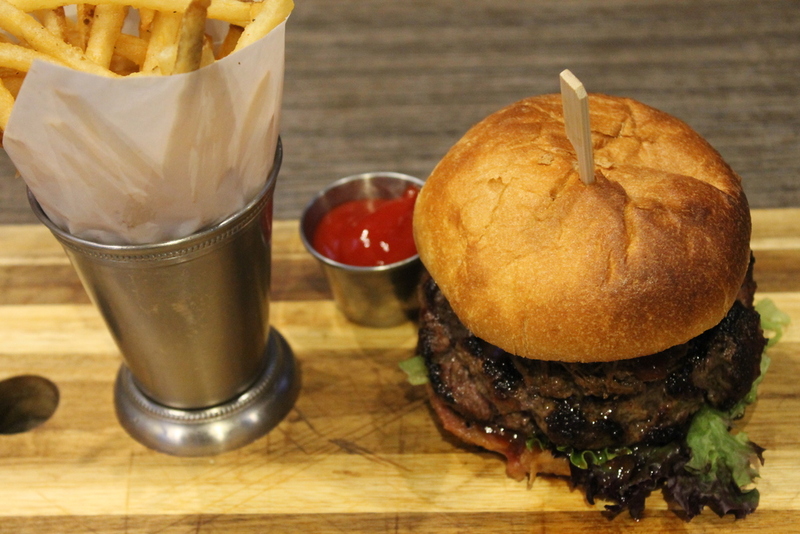 Chef Laith: I’ve made our Kentucky Saddle Burger for you which is inspired by horses and the Kentucky Derby. I upscaled it with short ribs -- meat on meat. We use bourbon and braising process. I’ve also made our Oven Roasted Lemon Chicken which is a Greek recipe; we braise it in lemon and finish baking it in the oven -- it’s double roasted. 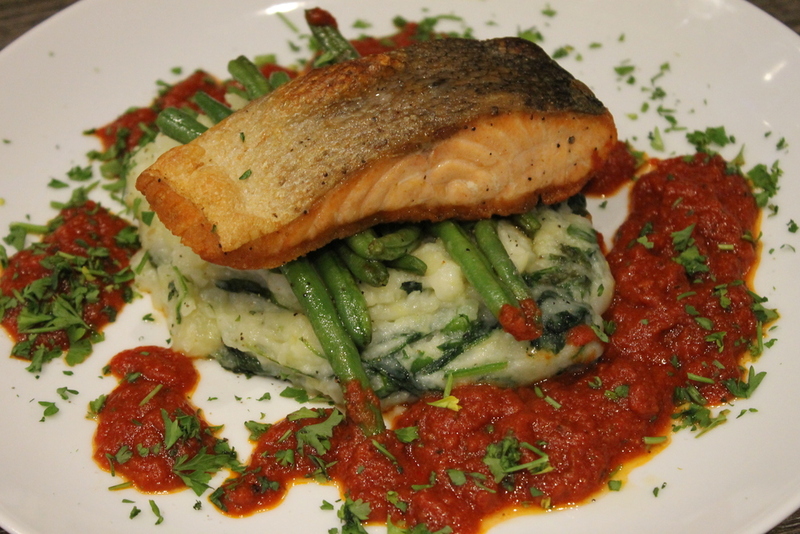 Then we have our Pan Seared Norwegian Salmon which is a take on a classic French dish. We added spinach to the mashed potatoes, which gives it an extra taste. Finally, we have our Asparagus and Mascarpone Omelette, which we serve all day, and serve it in our cast iron. We bake it in these and serve it right from the oven. We bake everything rather than fry it. Dean: This is all so delicious! What’s one dish you would eat everyday? Chef Laith: Probably a burger! Add an egg on it of breakfast, take out the egg for lunch, and for dinner add some bacon! [Laughs] Perfect for an all day everyday dish. Dean: Perfect! Do you have any future ideas for a menu? Chef Laith: Yes, I’m actually working on a brunch menu; I want it to be an upscale, elegant brunch menu. It’s going to have a lot of European influences such as savory crepes, salmon crepes, eggs benedict. Also some Middle Eastern dishes, Israeli eggs dishes. My goal is to make it the best brunch menu in San Diego! Dean: It already sounds so good! Chef Laith: I only like to put things on the menu if they’re fresh. I’m all about good quality food. Dean: When you’re at home, do you like to do crazy, elegant dishes? What’s your cooking style at home? Chef Laith: I actually cook very French. I don’t go too sophisticated. I made gumbo the other day, it was very good. I just open the fridge and make whatever I have work -- and I make it delicious.